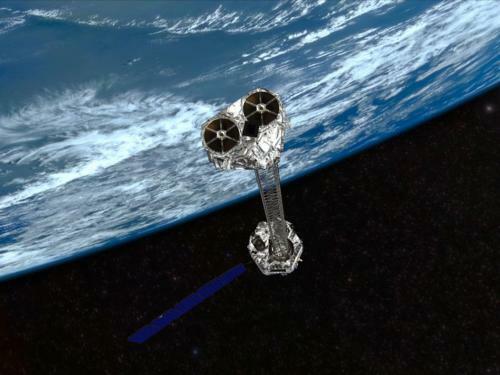 NASA's NuSTAR (Nuclear Spectroscopic Telescope Array) is currently being prepared for launch. Without any delays, the telescope should be launched by June 13th from the Kwajalein Atoll in the Central Pacific Ocean, where it will be attached to an Orbital Sciences Corporation Pegasus XL rocket, with OSC's L-1101 Stargazer ,which should be making its way to the party on June 5th-6th from the Vandenberg Air Base in central California, taking them both out of the atmosphere. The NuSTAR's mission is to study everything from black holes to the sun. It will work with other space telescopes, including the Chandra Space Observatory to paint a clearer picture about the more exotic objects in space, in particular answer questions about the physics of black holes and other anomalies. Despite being part of a network, it will be the most advanced telescope ever launched into orbit, with 10 times the resolution and 100 times the sensitivity of what's currently up there. If everything goes according to plan, NuSTAR will be in position around 7 days after launch. Following that, it should be fully functioning and feeding data back to the Earth's surface 23 days after that. Black holes are so exotic that you never know what you may discover by watching them closely. That is why there is amount of telescopes already floating out there. Hopefully, NuSTAR's state of the art technology will allow for some amazing breakthroughs in the study of black holes.